Almost one thousand years ago the great Indian teacher Atisha came to Tibet and began giving personal instructions to his Tibetan students. These instructions formed the basis for the Tibetan Mahayana tradition of training the mind called lojong. In these turbulent times, these teachings help us to remain peaceful by keeping us focused on compassion and altruism. Khen Rinpoche will share with us his insight into one of the most famous mind training texts, Langri Thangpa’s Eight Verses on Mind Training. Whether you are a beginner or long-time student, listening to these teachings from Rinpoche will help you to take both your hardships and successes into the path and maintain a balanced and joyful state of mind. This event is free. Knowing the importance of altruistic love and compassion for all living beings (Bodhicitta) is crucial. Taking this wisdom to heart and manifesting it in all our affairs can be quite challenging. Fortunately, Tong-len meditation is an amazing tool to help us along the path. 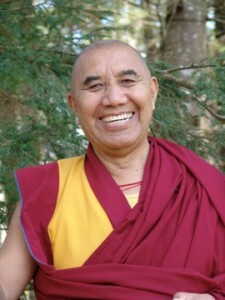 Khen Rinpoche will teach us how to take on the suffering of others and give our own happiness to them. It is a powerful way to generate Bodhicitta and, in the process, transform our own minds to be more peaceful, joyous, and free. This event is free. Join Khen Rinpoche and RMA Curator Elena Pakhoutova for a walk through the main gallery with an eye on pieces connected to Ladakh, Rinpoche’s homeland, and the Gelukpa tradition, Rinpoche’s monastic lineage. Rinpoche and Elena offer us a chance to enjoy these meaningful works with the benefit of their commentary. This event is free and requires and RSVP. Please email: laura.kozaitis@ourssp.org with “RSVP for March 29 Rubin Museum Event.” Thank you.